An amazing repository of Paleolithic culture was discovered in 1994 by a cave archeologist exploring the Ardèche Gorge of southern France, after removing the rock debris from a landslide that had blocked the entrance long ago. 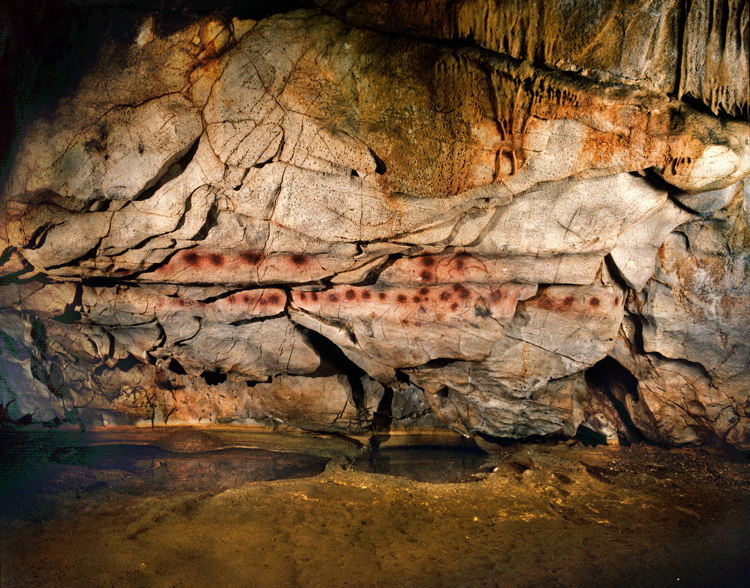 Bones and markings from giant cave bears were found throughout various chambers, while many astounding mural galleries depicting game animals, dot patterns and hand stencils confirm a long primary period of human occupation before being inhabited by giant hibernating carnivores. Named Chauvet Cave after the discoverer Jean-Marie Chauvet, the cavern system extends about 400m in length, with vast chambers covered in wonderfully painted panels created during the main period of human occupation from 32,000-30,000bp, according to carbon dating analyses. A secondary period of human presence at Chauvet Cave has also been determined at 27,000-25,000bp from charcoal bits deposited on the floor and carbon soot deposited during the burning of torches. The entrance of Chauvet Cave is placed high on the limestone cliffs overlooking an 's'-curve taken by the Ardèche River before flowing under a natural archway at Pont d'Arc. This rock formation is recognized as the largest natural land bridge in Europe. Panels along the walls of the wide main entry corridor present charcoal sketches of a megaloceros and woolly rhino in full profile, while deeper chambers display larger murals representing a variety of Paleolithic fauna including giant cave bears, cave lions, leopards, wooly mammoths, bison, aurochs, megaloceros, reindeer, horses, ibex, owls and insects. 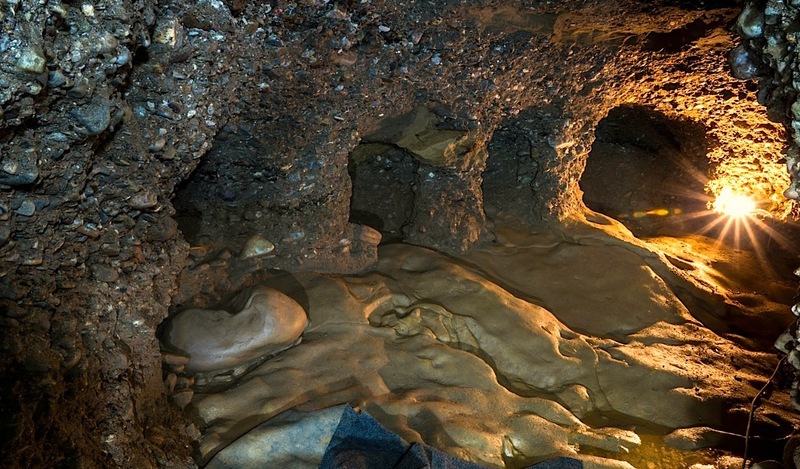 The first chamber, called the Brunel Chamber, is filled with stalagmites, stalactites and debris. Conversely, the walls and ceilings of deeper chambers are formed by smooth, undular surfaces that appear to have been augmented by human hands, such that inhabitants might enter into the cave safely. Elderly or blind members of the community would have been able to enter with ease by running their hands along the smooth walls to negotiate the long passages, which would have been cleared of debris during use. Chauvet Cave's beautifully undulating wall surfaces give a false impression of being organic, or having been melted into their present forms. The complex physiological effects of acoustic resonance stimulated by trance drumming within the chambers offers a solid explanation for the purposeful shaping of the cave's walls: for synchronizing the biorhythms of all participants with the beat of the Great Pyramid. Global biorhythmic entrainment to the deep infrasonic output of the Orion pyramids at Giza restores the natural telepathic mode of communication that normally occurs between mother and fetus during gestation in the womb. This advanced scientific knowledge of induced psychoacoustic telepathy informed a deep symbolic connection between the cave and the womb. Such fundamental cultural associations suggest the interior of Chauvet Cave may have been redesigned as a 'Cave of the Womb', with the cave opening and entry passages purposefully remade to resemble the sacred vaginal canal. Entry into the sacred cave system symbolically represented returning to the womb of Mother Earth to restore the inborn telepathic ability that was generally lost at birth by all human beings dwelling on the surface of the planet. All indigenous cultures of the world maintain this symbolic connection. Rumbling ultra-low frequency resonance of the world's pyramids was best received below ground, in subterranean villages that were elaborately constructed below most pyramid and megalithic temple sites. 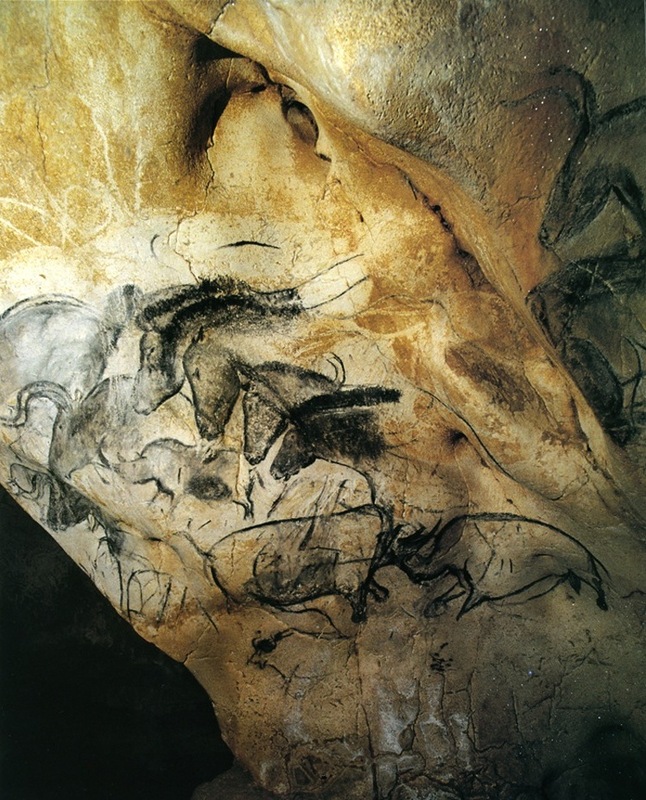 These outstanding features of Chauvet Cave directly link the Paleolithic site with the extremely advanced solid-state resonance technology of the pyramids, now gaining global recognition through definitive radiocarbon dates for the construction of the Bosnian Pyramids at ~30,000 years ago. The many inhabited cavesites of Paleolithic Europe display many features that are entirely consistent with the subterranean finds in Visoko's Ravne tunnels. Excavation of a labyrinth below the Visoko Valley has yielded huge geopolymer platforms with inscriptions that closely echo glyph texts from Chauvet Cave! 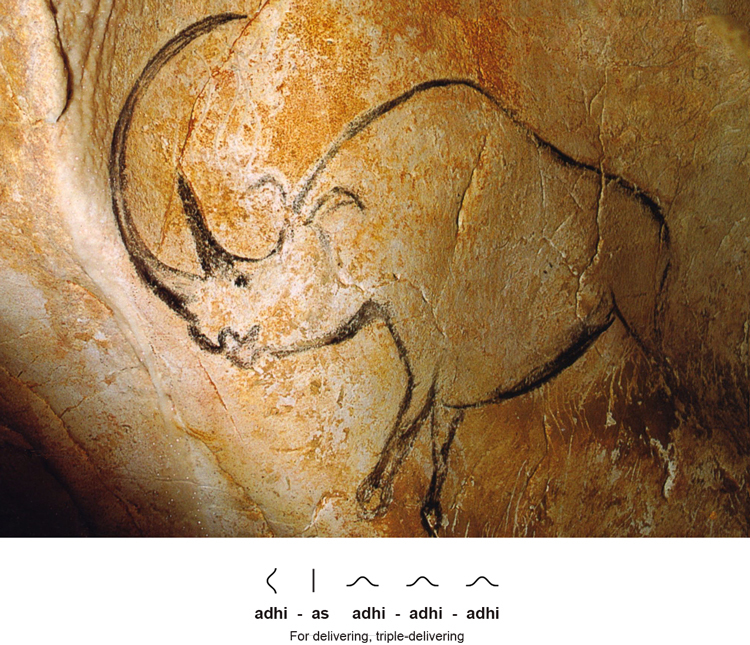 Above the claw marks of cave bears, a superb example of Paleo-Sanskrit ligatures embedded into charcoal sketches at Chauvet Cave has been well preserved in the image of a woolly rhinoceros, with long thin horns that distinguish mature females of the species (above). This large, extinct rhino species was specifically climate-adapted for grassland migrations along the northernmost corridor of inhabitable sub-glacial lands, sharing that latitudinal habitat with numerous herds of woolly mammoth and the reindeer that still persist in sub-arctic regions today. The exaggerated horns of the woolly rhinoceros form a glyph pair reading: adhi-as --"For delivering". The rhino's sweeping ears and arched back reemphasize the statement by repeating the action three times: adhi adhi adhi --"triple-delivering." This is a clear visual reference to resonant standing waves, which are generated by three frequencies in Fibonacci ratio transduced by the three main pyramids at Giza. The rendering of the ears and line of the back as three converging arcs is no accident, but exactly replicates the nonlinear structure of standing waves as defined by physicists in 2003. While terms like 'triple-delivering' have no clearly defined meaning among human populations inhabiting the planet's surface today, this ancient Vedic world culture has left us a with thousands of written records expressing their profound awareness of the physiological effects of focused infrasound resonance. Repetition of simple votive phrases can be seen in every representation by Paleo-Sanskrit artists. Beautifully waving forms of a small recessed alcove echo hieroglyph sets embedded in the design of sketches made on the geopolymer wall. 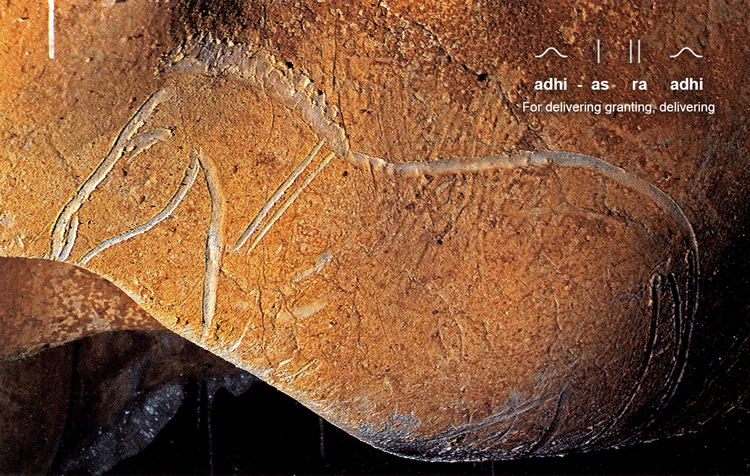 The horns and front legs of an Aurochs express the votive phrase: adhi-adhi ra --"Double-delivering granting", with reiteration in the wall forms repeating: adhi-adhi --"double-delivering" (above). Animals have been selectively shown in profile views for the purpose of making ligature phrasing more legible, with notable exaggerations of the features of ears, horns, legs and belly for expression of the sacred. The great disparity that exists between the conceptual sophistication of cave wall texts and the brevity of language used by cave-dwelling Paleolithic civilization has denied their translation until the present study. Application of the Schildmann Paleo-Sanskrit decipherment offers a scientific context for interpretation of many thousands of ancient text-baring artifacts recovered from Europe's aboveground habitation sites and newly discovered pyramid complexes with related sites on other continents. Recognition of the Vedic formula for standing waves that defines the spherical distribution pattern of infrasound convergence nodes, [ zn+1 = zn2 ], facilitates integration of seemingly disparate concepts from quantum physics and astrophysics to clarify the profound intention behind these most ancient artworks. 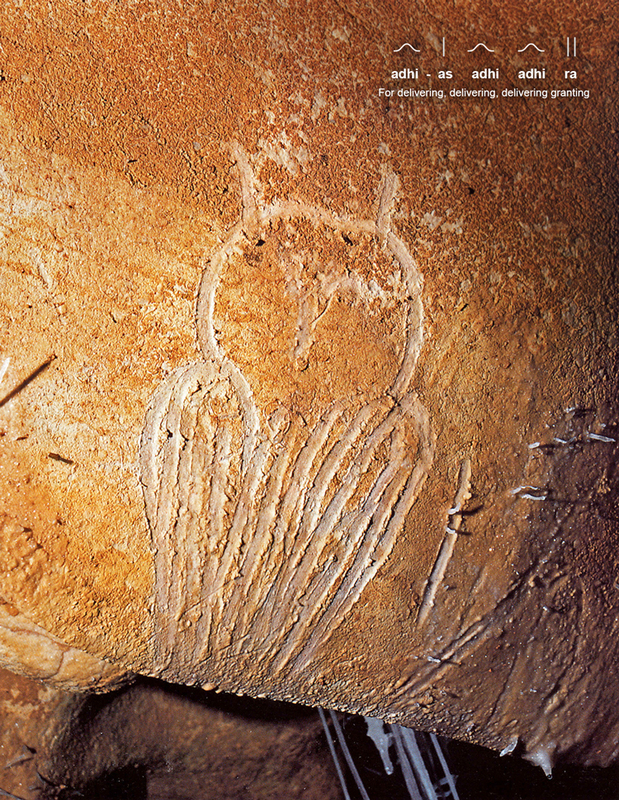 The limited variety of phrases marked on cave walls is contrasted by the wide variety of species being depicted, which may also have held specific associations for shamanic journeying in the spirit world. Repeating sets of Paleo-Sanskrit glyphs are composed in ligatures that form basic sketches of an owl and a horse (above and below) reading: adhi-as ra adhi --"For delivering granting, delivering." Paired lines that form the ra glyph meaning 'granting' are represented in the owl's 'horns' and the paired stripes at the base of the neck that characterize the ancient horse breed known today as the Przewalski. The notable plasticity of the cave wall substrate that enabled easy handling of the material by simple finger strokes witnessed in these artworks is undeniable. Close inspection of the edges of long finger markings confirm they were made during the slow process of curing to hardness, immediately after the wall/ceiling surfaces had been refaçaded by human hands and painted with orange kaolin clay sealant. Resurfacing the cave served a primary practical purpose of strengthening the walls and ceilings against fracturing and fall-ins that endanger occupants during tremors. 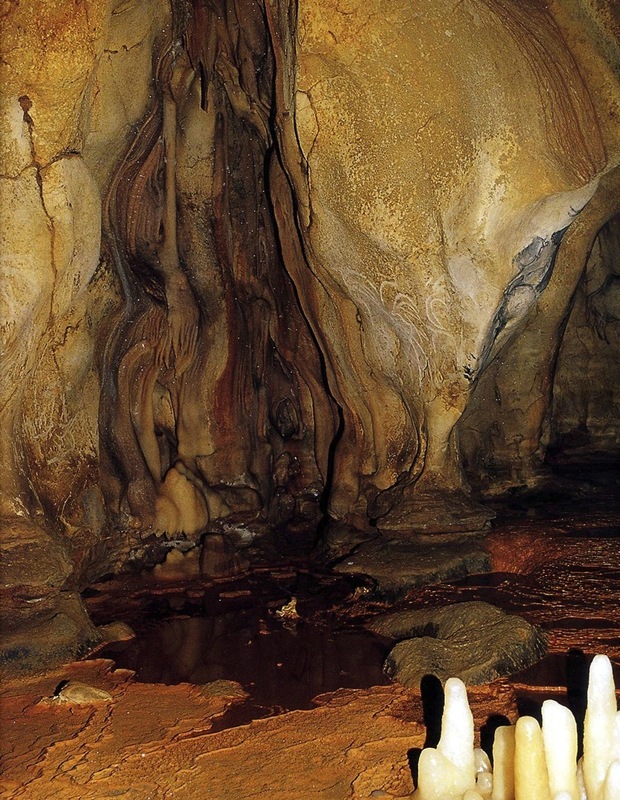 Sealing the chambers with geopolymer paste (likely composed of caustic soda, sand, powdered limestone and kaolin clays) greatly reduces water seepage that occurs in all limestone caverns due to the sedimentary stone's relative softness and porosity. Extraordinary evidence for this surprising conclusion is visible throughout the cave, and can be readily observed in detailed photographs of wall and ceiling textures (below). Refaçading the greater part of a cave system with the immense dimensions of Chauvet Cave --with multiple large chambers comprising a total floor area estimated at over 3,500m2-- requires mastery of geopolymer chemistry in the reconstitution of resonant natural materials for creating sacred spaces that engender psychoacoustic synchronization. The high calcite mineral content of limestone was widely employed by ancient pyramid-builders throughout the world for its piezoelectric transduction of ultra-low frequency sound into an electric charge that enhances human health through electroporation. The form, consistency and energetic function of Chauvet Cave's refaçaded surfaces show strong similarities to geopolymer megaceramic healing platforms recently uncovered in a vast labyrinth of tunnels penetrating the conglomerate bedrock below Bosnia's Visoko Valley near the Pyramid of the Sun. The specific use of orange kaolinite clays for sealing the geopolymer refaçading within Chauvet Cave closely matches advanced resurfacing processes used in Visoko's Ravne tunnel network. Site construction and primary occupation periods for both the Bosnian Pyramids and Chauvet Cave have been well established by carbon14 radioactive decay methods at ~30,000 years of age, confirming the two sites were contemporary with each other. These findings are strongly reaffirmed by the common use of hieroglyphic notation that has been identified and translated as Paleo-Sanskrit writing at both sites. Furthermore, texts at each site repeat similar short phrases describing their function. Material analysis of the composition of the Ravne healing platforms conducted by the Rudjer Boskovic Institute for Atomic Physics in Zagreb, Croatia found the material to be composed of a synthetic geopolymer ceramic. The basic geopolymer components were hand-mixed into a malleable clay paste that could be reshaped as desired during a cure time of several hours before reaching full hardness. A deeper passage of the Ravne tunnels excavated in November of 2013 uncovered the same geopolymer ceramic material comprising the large healing platforms, yet in this latest case entirely refaçading a wider area of tunnel floors and reinforcing the walls in the exact manner and form witnessed at the closely related contemporary site of Chauvet Cave. Easily distinguished by microscopy, irrefutable evidence for the man-made geopolymer origin of flowing limestone formations in Chauvet Cave has been preserved in the form of finger marks, palm impressions and visible bits of debris and organic matter distributed throughout the geopolymer facing (below). 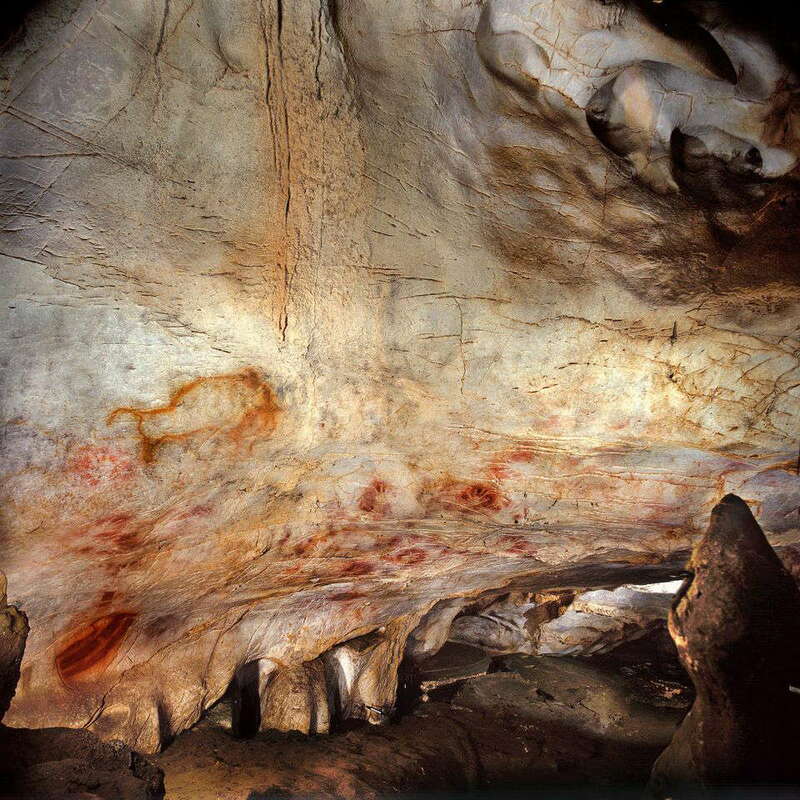 Refaçading of the cave interior also provided smooth surfaces perfectly prepared for mural paintings on a grand scale. 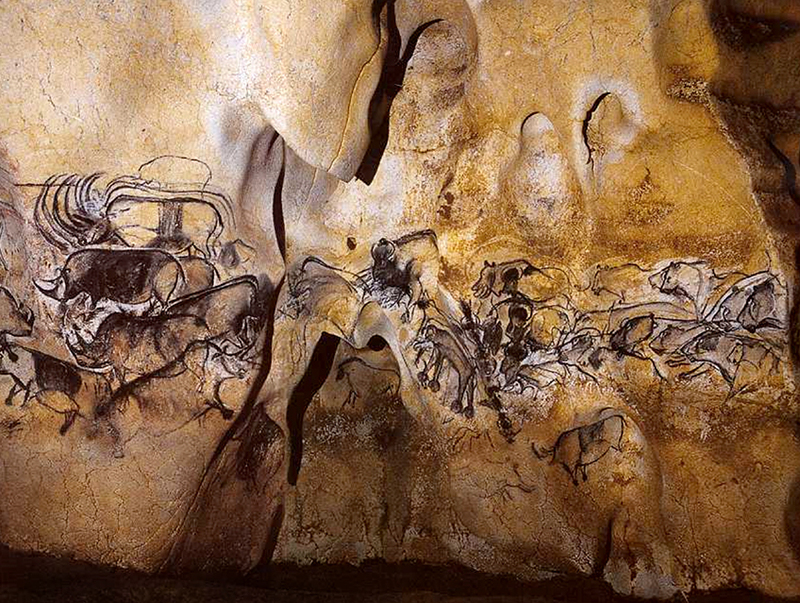 The cavern walls' uniformity of color and texture was an obvious goal of the reconstruction work undertaken by the primary Paleolithic inhabitants of Chauvet Cave, who left thousands of colorful markings, some of which even state the specific functions of these deep augmented chambers. Blood red and yellow ochre paint was carefully airbrushed onto the smooth walls using a bone tube, in psychedelic patterns of large red dots and occasional groupings of lines that are now recognizable as language signs. 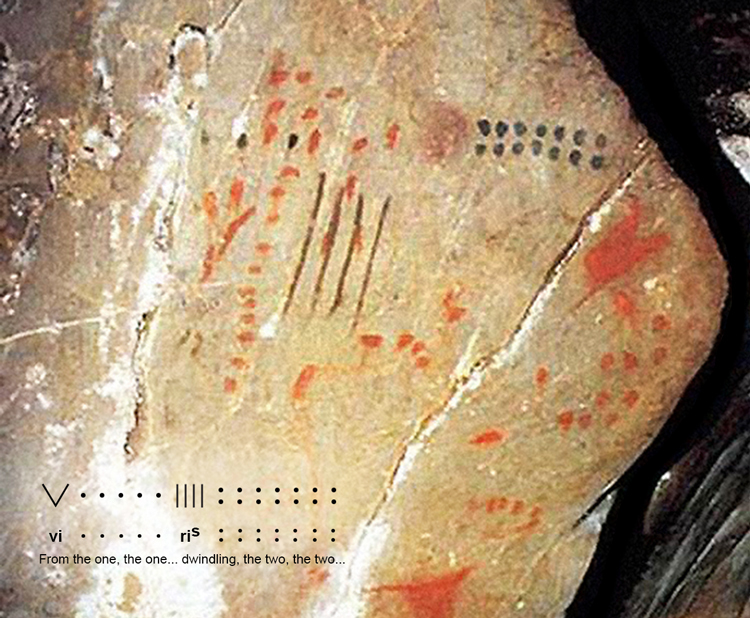 Smaller groups of markings appear to relate short phrases that offer direct explanations for bioelectrical healing functions of the augmented cave walls as previously identified on geopolymer platforms in Visoko's tunnels. 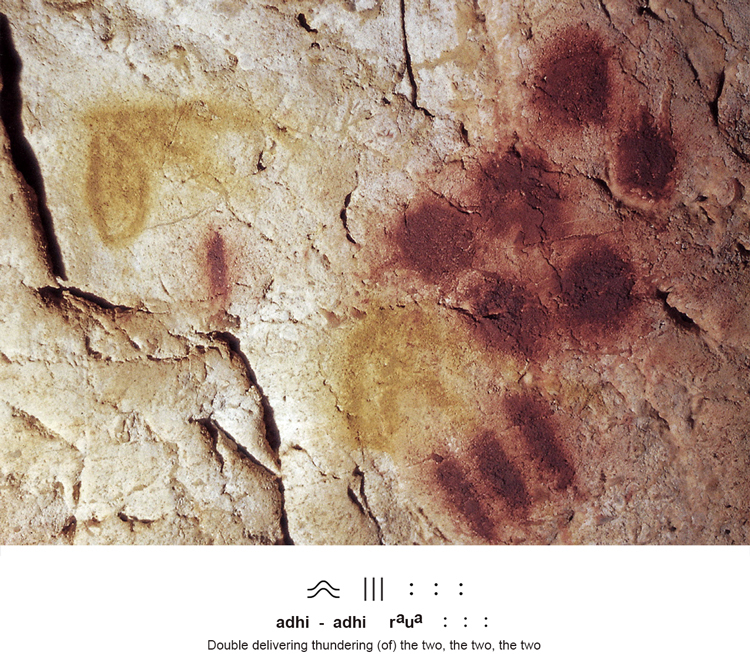 At Chauvet Cave, the distant sources of infrasound resonance that activate the cavern walls were identified in a cluster of signs praising the two deities Svar and Indra, the Sun and Jupiter (above): adhi-adhi raua : : : --"Double-delivering thundering (of) the two, the two, the two." Repetitive phrases such as this have evaded detection as language signs for decades, yet now inform a profound revision of Paleolithic society according to the advanced Atlantean physics of nonlinear standing wave resonance redefined in modern times by Nikola Tesla as 'wireless' technology. In fact, words written on cave walls over 30,000 years ago speak to us in the same high Vedic knowledge of quantum physics that Tesla had reattained and directly linked with Sanskrit cosmology. Modern Sanskrit has preserved much of the spiritual awareness and cultural traditions associated with the preceding Paleolithic civilization, offering exceptional insight for modern researchers following in Tesla's footsteps. 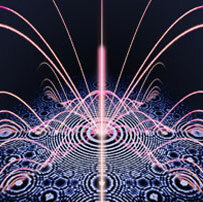 Without this crucial context of advanced quantum physics, the simple statements of Atlantean authors cannot be grasped. The bioelectrical granting of Indra, 'the one', was praised in the short phrase: adhi ra * * * * --"Delivering granting of the one, the one, the one, the one" (above). The cosmic infrasound environment of our entire solar system has been virtually silenced throughout the generally acknowledged period of known cultural history. For this reason, we must reorient ourselves to the latest findings of nonlinear acoustics to comprehend the votive language of our distant ancestors that relate beneficial effects of the world's pyramid network in full operation, generating a greatly amplified field of planetary resonance and a corresponding enhancement of human consciousness and lifespan. While archeologists attribute the largely unchanged condition of the caves for over 30,000 years to their incidental closure by fallen debris, the notable lack of water-driven calcite deposition is not so easily explained away. The exquisite state of preservation at each of these Paleolithic sites is the direct result of comprehensively conceived and expertly accomplished refaçading of the subterranean vaults. The extensive global network of Paleolithic cavesites that replicated the telepathic environment of the womb included hundreds of well-known subterranean villages and shelters. 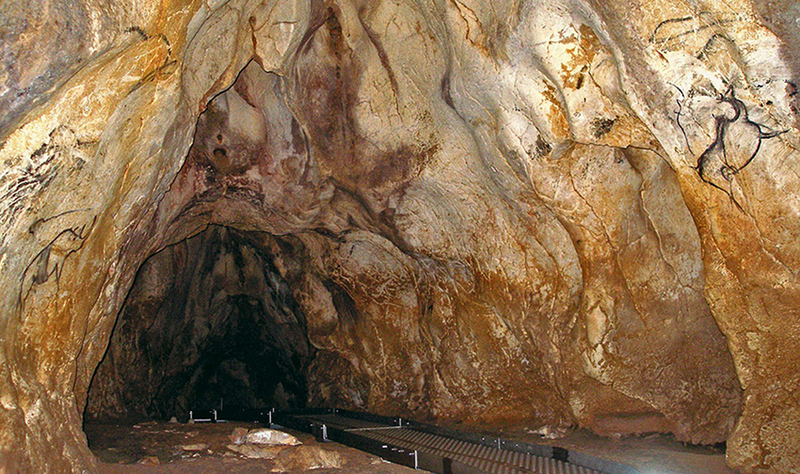 Scores of famous ancient sites exemplify newly identified cultural traditions and global distribution patterns, including Cosquer Cave, Cougnac Cave, Niaux Cave, Rouffignac Cave, Mas d'Azil Cave, Peche Merle Cave, La Madeleine and Amelana's shelters, La Font du Gomme and Les Eyzies promontories, El Castillo Cave, Altamira Cave, Ekain Cave, La Pileta Cave, Gargas Cave, Buxu Cave, El Pindal Cave and Covalanas Cave. This society of cave-dwellers display the same advanced knowledge witnessed in Visoko, making tribute to the thunderous workings of the stars that reverberate along geometric alignments where infrasound wavelengths are focused by the Orion pyramids. Loud booming and deep rumbling noises were most strongly felt within caves during that high epoch, inducing tri-thalamic entrainment en masse. 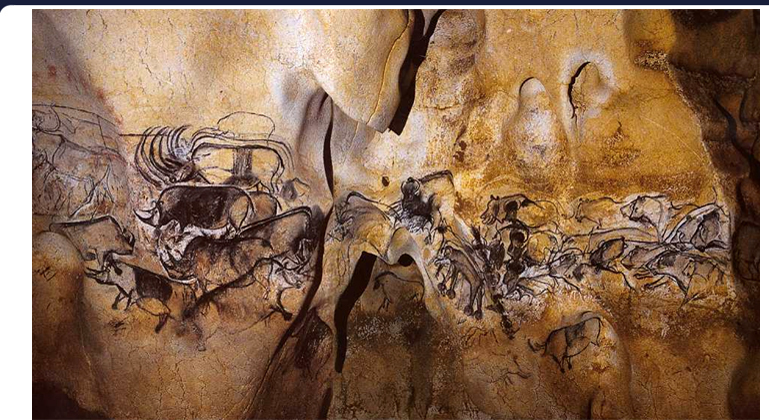 The advanced geopolymer reinforcement and augmentation of limestone caves was also skillfully accomplished at Niaux, Ekain and La Pileta Caves over 12,000 years ago by Paleo-Sanskrit-speaking descendants of the inhabitants of Lascaux and Chauvet Caves. Special factors in selecting subterranean habitation sites included their location along acoustic resonance bands that provided both bioelectrical healing and biorhythmic entrainment, regarded as divine influences benefitting the good mother. 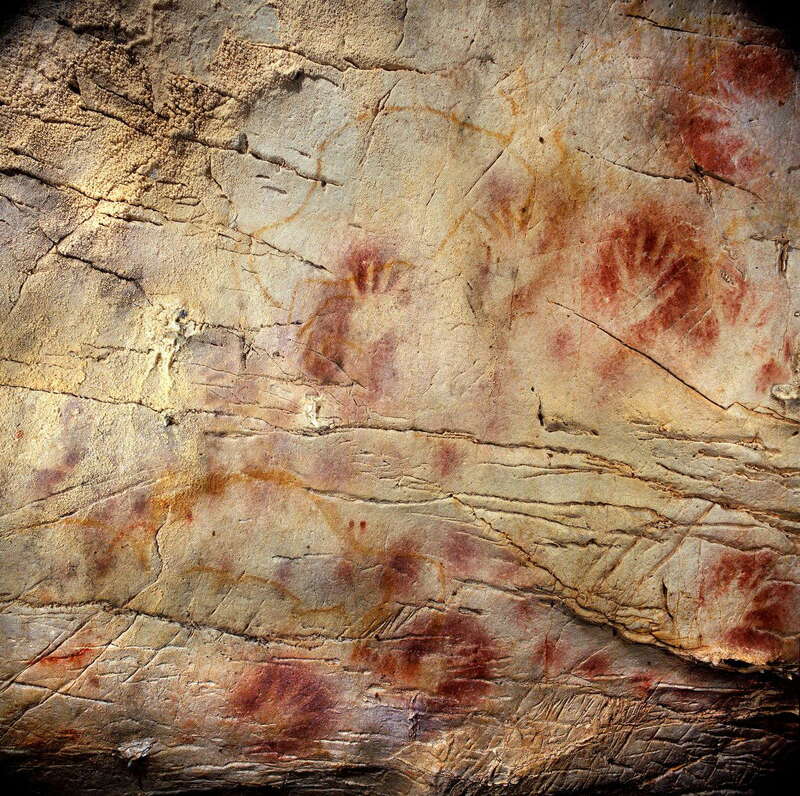 Deep red hand stencils and hand prints left on cave walls over many generations by the makers of these sites demonstrate the predominance of female artists in this remarkable matriarchal society. Murals line the many underground galleries that functioned as sacred ceremonial spaces where psychoacoustic drumming, chanting and singing once synchronized the biorhythms of all within the cave. 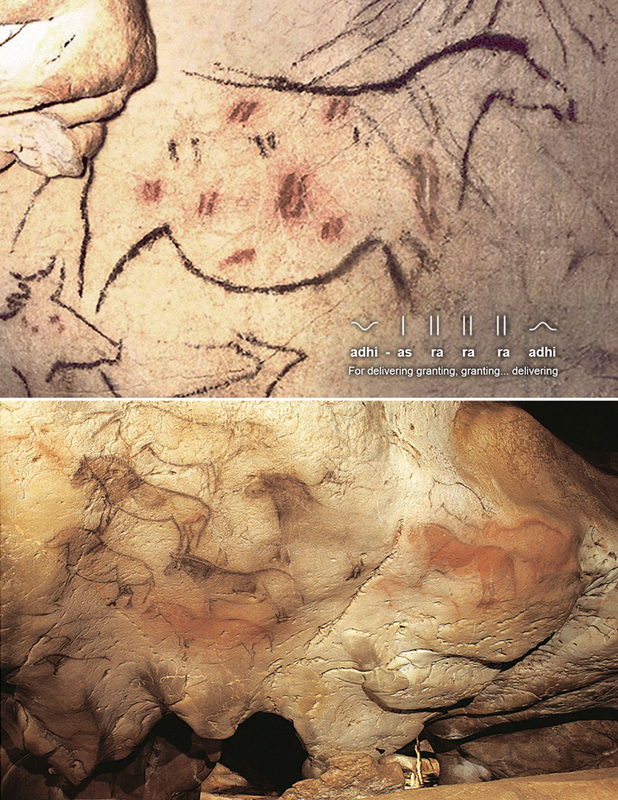 Multicolored murals preserved within the chambers of Niaux and Ekain Caves display game hunting imagery comparable to other sites in the region, likewise labeled with Paleo-Sanskrit glyphs. 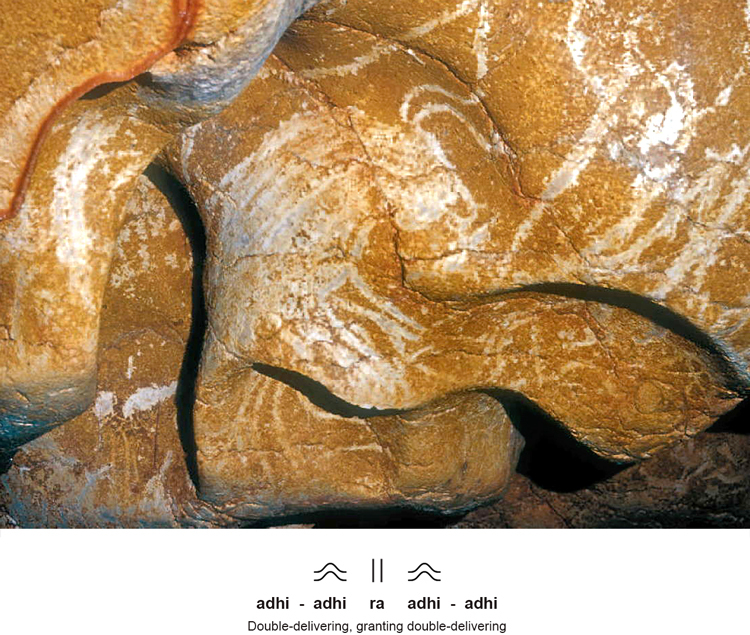 A clear example in charcoal from La Pileta Cave depicts a horse with its belly exaggerated to form the adhi glyph for 'delivering' (above). Vital organs of the horse's torso targeted by spear-throwers during the hunt were labeled with the ra glyph meaning 'granting', marking vital points granting the kill. A geopolymer limestone wall at Niaux Cave has been decorated with a mural painting consisting of many dots and line segments in black charcoal and red ochre (above). The dwindling state of resonance conferred from the deities Svar and Indra is marked on the artificial walls that still act as cosmic receivers, reading: vi * * * * ris : : : : : : : --"From the one, the one... dwindling, the two, the two... "
Overlooking the Vézère River Valley of southwestern France, La Madeleine rock shelter was discovered in 1883, yielding very similar cultural remains including several implements carved from bone and mammoth ivory. Radiocarbon dating has established that the primary occupation period at the site extended from ~15,000--9,000 years ago, a period encompassing the activities of 200+ generations. A pair of reindeer have been beautifully engraved into the obverse surface of a bone fragment identified as a reindeer metatarsal, bearing an explanatory hieroglyphic label that is repeated three times, each grouping proving the well-used votive phrase: adhi-as ra --"For delivering granting..." (above). The most impressive of the many recovered relics is a finely inscribed mammoth ivory carving measuring 10cm in length, depicting a bison licking its coat (above). The bulk of the bison's body is rendered in full form, whereas the bison's head is rendered in relief as it curves back against the shaggy torso. The smoothly curved horn forms the adhi glyph that signifies 'delivering', while two lines of ra glyphs for 'granting' run down the broad lower jaw of the bison, altogether giving the same votive phrase from that bygone era of high knowledge: adhi-as ra ra ra ra ra --"For delivering granting, granting, granting..."
Complex cultural traditions revealed in the Paleolithic caves of France are also evident at several closely related archeological cavesites in neighboring Spain. The spectacular interiors of Spain's most famous caves, El Castillo and Altamira, display the same attention to cave ceiling and wall resurfacing for the identical purposes involving the psychoacoustic focusing of planetary infrasound for bioelectrification. The consistency of such astonishing yet previously unrecognized feats of Vedic engineering and geopolymer chemistry awaits comprehensive validation by materials testing and analysis at multiple cavesites. Proceeding through the grand entrance at El Castillo Cave, meaning 'The Castle', the first chamber opens to reveal an expansive wall whitewashed with a calcite undercoat and covered in broad swaths of saturated ochre markings (above). 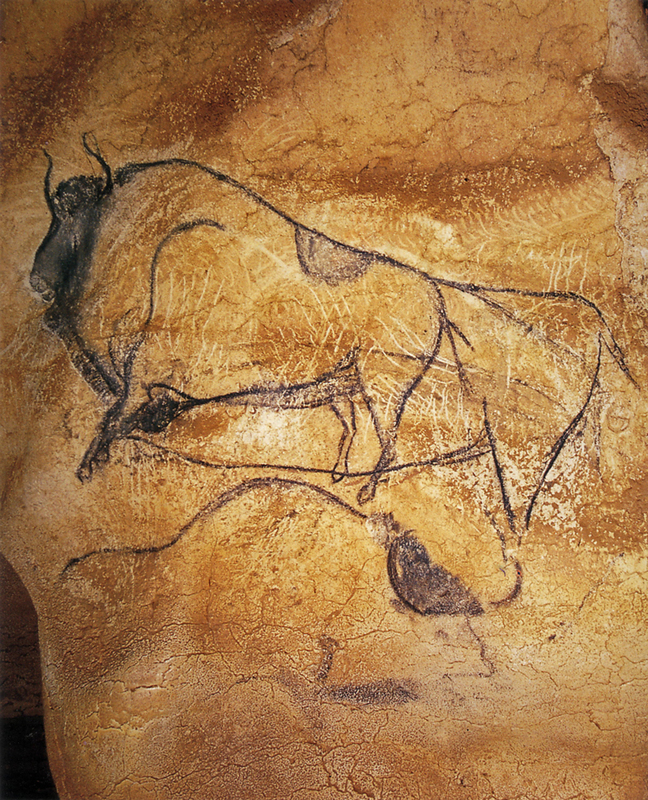 Several bison were rendered as very loose outline sketches using the same airbrush technique on display in the murals of Lascaux, Chauvet Niaux and so many other caves. 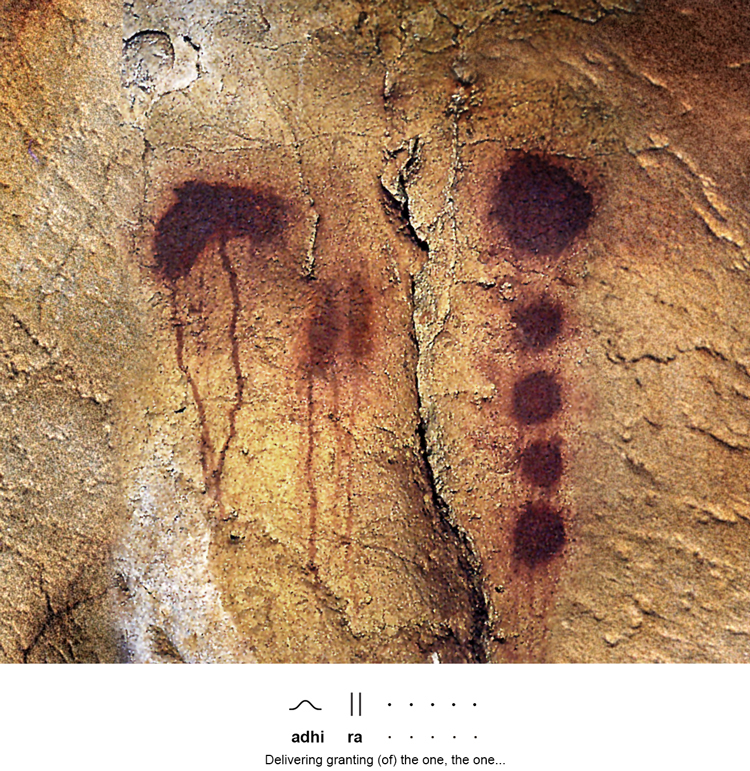 Roughly sketched yellow ochre images of a pair of charging bison have been partially obscured by a series of negative handprints carefully airbrushed in red ochre paints (above). Seamwork visible in the artificial geopolymer facing shows areas where the synthetic stone paste was applied in sections according to loose grid-patterns formed by sets of roughly parallel lines, at times forming rhomboids. In addition, the general lack of rock carving and engravings at all of these advanced Paleolithic cavesites where mural painting was practiced on a breathtaking scale, provides strong support for the primary acoustical and bioelectrical purpose of the extensive wall/ceiling refaçading. These specific functional features of geopolymer chambers also explain why the inner chambers of the Great Pyramid were not engraved with hieroglyphs. The remodeled caves of Europe were carefully selected and redesigned as Caves of the Womb for transceiving the focused infrasound of the global Atlantean pyramid network. Remarkable wall structures, mural paintings and bone tools from Altamira Cave also betray the skillful workmanship of ancient Paleo-Sanskrit artists and engineers. 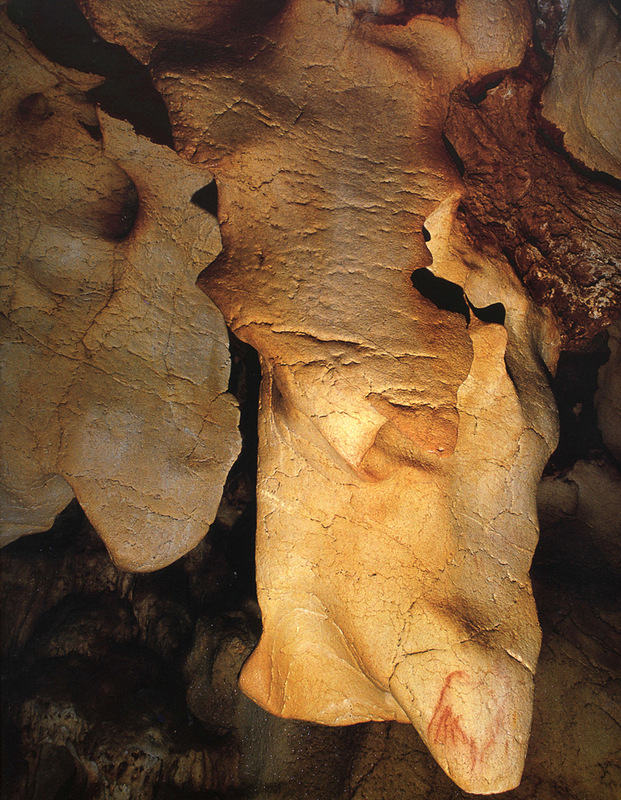 Many sections within Altamira cave have been remodeled with geopolymer limestone paste that presents the same artificial aspects witnessed at El Castillo Cave. One particular angled wall transition presents a series of perfectly horizontal steps that stand out as manmade, baring no evidence of having been carved from the natural bedrock (above). Similar features of geopolymer casting were replicated in the Inca stonework of Peru, at sites such as Saqsaywaman in the ancient sacred city of Cuzco. Comparative analysis of temple stones versus natural limestone from rock quarries near the site showed evidence of geopolymer reconstitution. Material culture among Paleo-Sanskrit communities also provides much solid evidence for complex linguistic expressions recorded in thousands of years of accumulated artistic activity. 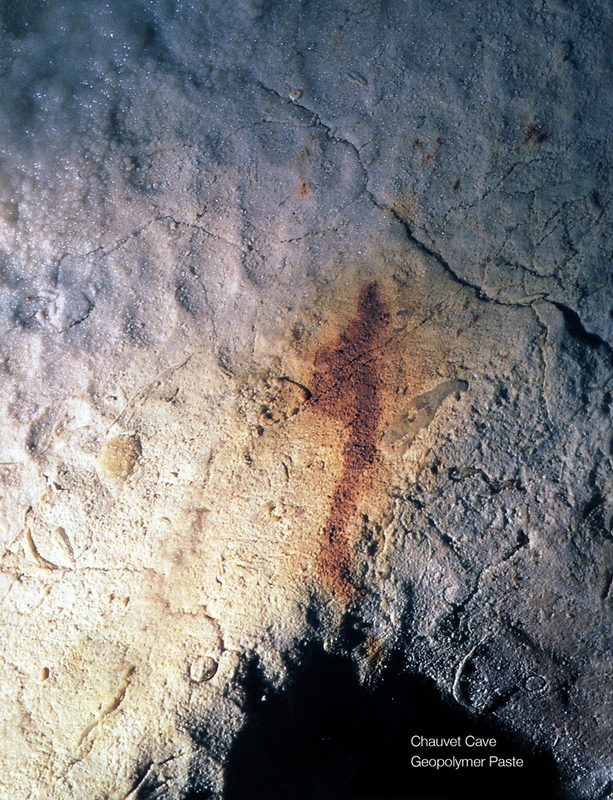 Paralleling excavations at Lascaux Cave, bone spearpoints from Altamira Cave were labeled with hieroglyphic inscriptions relating their specific functions. One small example with three glyphs reads: ra-as ra --"For granting (the kill), granting." 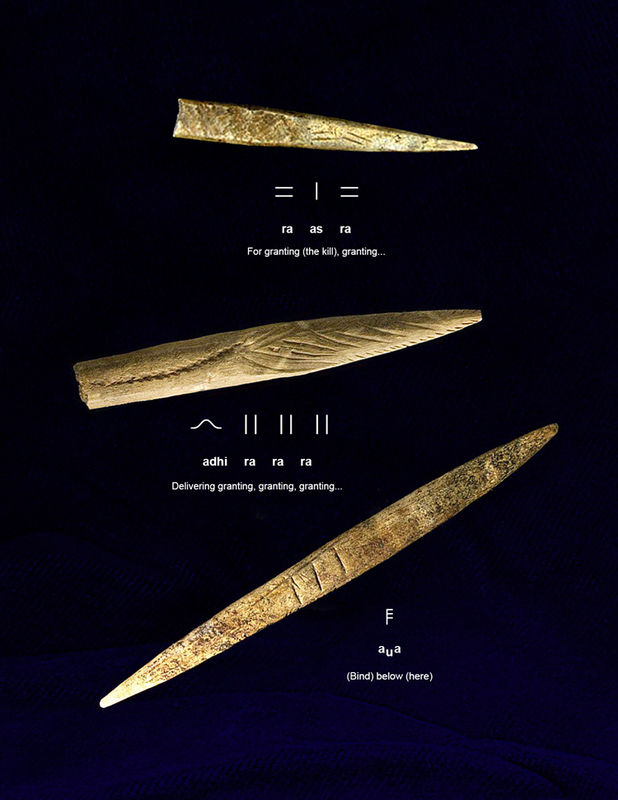 A wider bone point gives the explanatory phrase: adhi ra ra ra ra --"Delivering granting, granting..." while a symmetrical spearpoint marks the midpoint where it was bound to the shaft with a single aua glyph for the word 'below', instructing the hunter to "bind below here." The relics of Paleo-Sanskrit-speaking communities from the Paleolithic and Neolithic periods are not limited to Europe, but appear in the archeological record preserved at cavesites all over the world. There are clear indications that the remains of advanced material cultures from those periods have been discovered at many undisclosed locations in China, where thousands of pyramids from this same culture have been supressed. The largest and most famous of China's pyramids are situated in the Xi'an area. 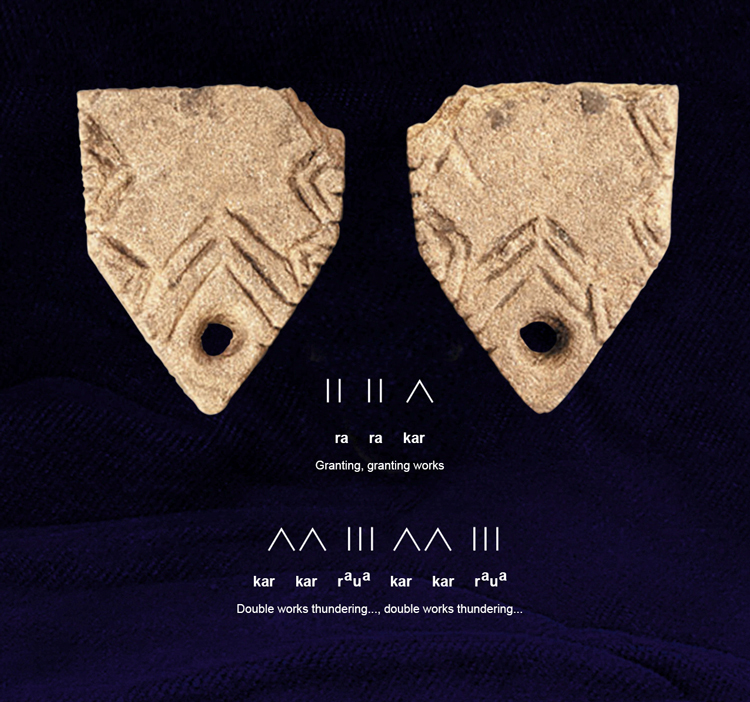 One fragmented artifact from China that has been reported publicly was discovered at Qihe Cave, with human occupation dated to ~12,000--7,000bp, and displays a perforation that suggests potential functions as a loom weight or possibly a bullroarer for producing infrasound as used throughout Australia and the Americas during that era (above). 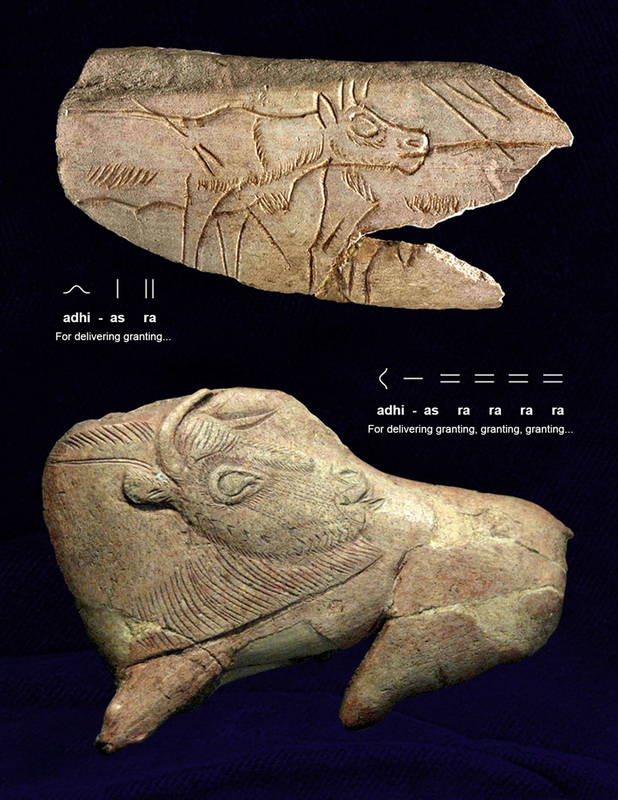 The front and back of the flat stone fragment are engraved with virtually identical repeating glyph patterns reading: ra ra kar * --"Granting, granting works (of) the one" and kara raua kara raua --"action (of) roaring, action (of) roaring..."
The global continuity of Paleo-Sanskrit society is plainly evident in the overwhelming consistency of artistic expression and linguistic references worldwide. Messages from that high era on Earth praise the bioelectrical granting of the planet Jupiter, identifying sacred functions of the world's pyramid network for the synchronization of human consciousness within stone chambers, within Caves of the Womb.